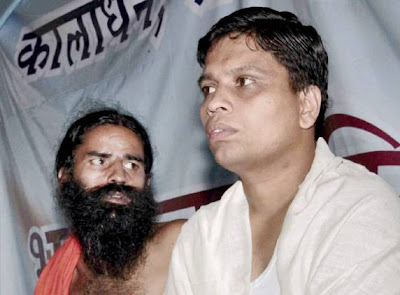 Indore - Acharya Balakrishna, who was considered the right hand of Yoga guru Baba Ramdev, he was arrested but then also the Hunsle are still elevated of ‘Baba’. Speaking to the media in Indore, Baba Ramdev said, I have pledged not to take part in electation. But I will continue to fight against the system's loopholes. Baba Ramdev said some days ago, contest of the Lok Sabha’s elections will depend on revolution which is held on 9th August. When he was asked whether he would play the role of Chanakya? Then he said, if I will say anything then dispute may occur. On the other hand, Balakrishna was arrested Friday on charges of CBI for the fake document to get passport because of this offence today he have to get present in special court. Baba Ramdev can go to Dehradun on Saturday to meet Balakrishna. Nepal government agency asked information related to the life of Krishna, and about their village. But the CBI's this move has provoked Baba Ramdev. Under pressure Nepal government is taking action for this case. Baba Ramdev has said that by doing all this government wants to stop his ‘Andoln’, but that will not going to stop. For using fraudulent documents to obtain passports in India, the CBI arrest Balakrishna from his office in Hardwar Patanjali Yogpeeth Ltd. But he was not present in the court at that time. Through lawyers he demanded time to go to the Supreme Court. But court doesn’t allow to the Acharya & the warrant issued to the court and the Acharya. Based on this at that afternoon he got arrested by the CBI in collaboration with local police. In coronation Hospital Medical has been made by Acharya. The CBI investigation against Acharya had started a year ago. He is also accused by hiding the citizenship. On 10th July CBI had filed charge sheet against Balakrishna. Naresh Chandra Dwivedi, principal of Sanskrit College also is also in fault in this case, he also have to present in the court.